I am now the proud owner of a new Schwinn Bike!! Yippee!! I'm hoping to get out this morning and take it for a spin. I'm sure it will only be around the block. Jack and I were laughing yesterday... he asked if I wanted to go for a bike ride with him. I said...are you kidding? Do you know how long it's been since I've been on a bike? I'll be lucky if I can still remember how to balance the silly thing! Then he proceeded to tell me he only made it around the block the first time he got on his. He was pooped. I'm sure that will be my experience also... I have no oooopppfffff anymore. ((oh how I hate getting older)) However, I will give it a try. Reporting on this episode will be tomorrow morning. Then we're meeting some friends at Mimi's for brunch - and ordering our Easter dinner from them ((I think???)) Where we are eating Easter dinner on Sunday... is still a bit puzzling to me at this time. But... I'm leaving that to Jack. He can make this decision! Then...it's off to my sisters to look through some things in her garage - haul stuff to my house or to the Goodwill. We will then be finished with her house and it will be empty! Yippee!!! She's all good to go at her honeys house now. Then at 4:00 I'm going to the movie and to dinner with my friend Karen! Whew...I'm tired already. Then home to watch American Idol.... hope all goes well for everyone tonight in their singing! I've noticed in my travels over the past year... hotels are offering water in their breakfast and reception areas for their customers. They have them in HUGE beautiful crystal clear decanters with spouts. Inside the water are always wonderful surprises such as lemons, limes, strawberries, cucumbers... it makes the water taste so fresh and wonderful. Here's a cool idea for us to make at home. Simply take your cupcake tins... fill them with water and a slice of lemon, orange or lime. Freeze them... pop them out of the tin and place them in baggies. Then.. you have pre-made citrus ice cubes for your pitchers of water. Isn't this a cute idea? So simple... so divine! 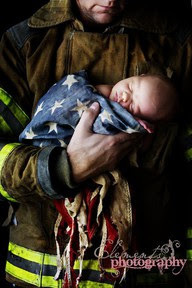 I thought this photo was very heart tugging! 911 will be in our hearts forever won't it? I know I'll never forget it... never! I can still remember that day like it was yesterday and it's over 10 years ago. Wow... makes me shutter when I think of it all over. I've heard people say.. let's stop talking about it and move on! That will NEVER happen folks... never. It will NEVER be forgotten! OH MY GOSH... I would love to have this garage! Isn't it so pretty? 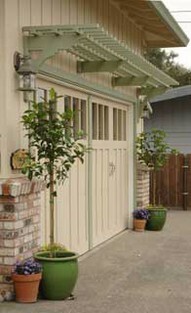 Sure beats the ugly garage door we have...! The cream and green go so pretty together. I'll just pretend this is on my DREAM house!! A girl can have dreams ... can't we? Don't I just look so sweet? 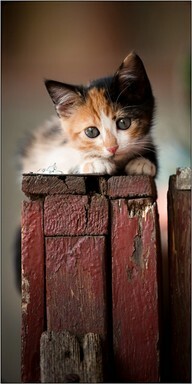 I wonder why all calico cats are female? See... there's another question for Heaven! I just love the simplicity of this quilt. There is something about a crispy white background and simple squares that make my heart flutter. 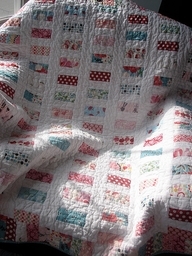 I can just see this quilt on my bed...smelling all clean and fresh...soft and cuddly. Gosh... I think I could crawl right under it... RIGHT now and take a good long nap! 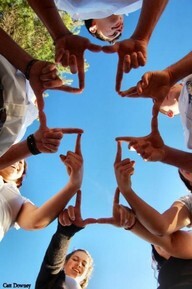 Isn't this cool...these kids all put their hands together and made a cross! Oh so clever!!! I've never seen this done before. Taxes are done.... YIPPEE!!!!!! We get money back! YIPPEE!!!!!! I'm so relieved that is over. It was keeping me awake at night. With this being the first year we have been at full retirement, I had NO IDEA what our end results would be. Everything worked out great...whew! 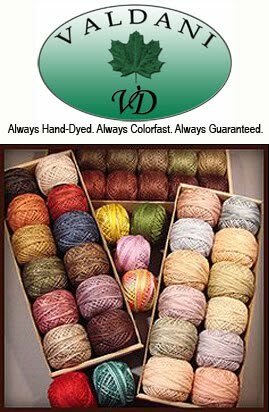 I'm now off to my sewing room. I must put away all of my weekend class "leftovers" and straighten up ((quite a bit... how does it get so messy ... so fast??? arg!!) Then it's time to line up projects in order of their completion deadlines. I just picked up fabric to make a sample for Cinnamon's. It's a small "spool" quilt that will be in the next Primitive Quilts & Projects magazine. It is adorable.. and has wool applique on it as well. You're gonna love it... and I think they will be making kits for it. I'll post pictures as it progresses!! Have a fun day... mine is going to be BUSY! !